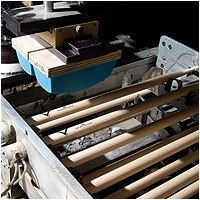 Wood type and moisture content are the key elements to a drumstick's response and durability. 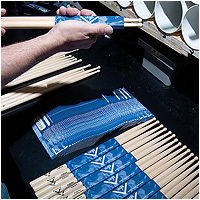 Vater crafts their drumsticks from only the finest American Hickory and Maple available. Vater is extremely picky about the moisture content of their dowels. Too much moisture produces a stick that feels "rubbery" and that will warp quickly. Too little moisture will produce a stick that is very brittle and will break easily. 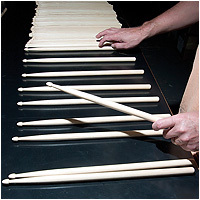 Vater manufactures drumsticks from dowels that measure a particular percentage, making a stick that is very durable and will remain straighter longer. 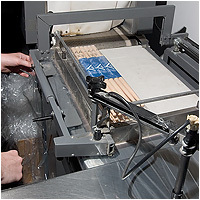 Other drumstick manufacturers opt to use dowels that measure at a lower moisture content because it will yield them a higher percentage of straight sticks from a production run, thus sacrificing quality and durability. There's an old saying that Vater has adopted in their drumstick making: "Quality not quantity". Vater's mission has always been to produce the highest quality drumsticks on the planet. Period. Vater has set very high quality control standards during the production process. From the lathing, sanding and finishing, to tip shaping, rolling and pairing, the goal is always to produce the best quality drumsticks possible. The most popular wood used for making drumsticks. Hickory is denser, heavier and more rigid than Maple. Hickory can also absorb a great amount of shock, which reduces hand and wrist fatigue. Dark, or "brown hickory", is found closer to the tree's center and is slightly denser and heavier than "white" hickory. 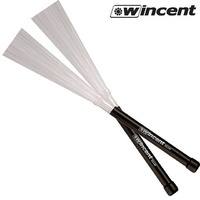 higher quality than all other leading drumstick manufacturers. for the performance life span of the drumstick. 100% of Vater's drumsticks are manufactured in the USA. All Vater sticks are tone & weight matched by computer analysis.